- We've all had those days, right? When you think to yourself, "This can't possibly be my life. These can't possilby be my kids." This bumper sticker is good for a giggle as you make your way to soccer games, ballet lessons, summer camp, and more. Just ask yourself, "Who are these kids and why are they calling me Mom? ", and hold on to your sanity for one more day. "Who Are These Kids…" bumper sticker measures 11 1/2" by 3". This high quality vinyl decal is resistant to UV and water, and is made to last. Will it look exactly like the one in the picture? Well… probably. You see, we don't print these ourself, and from time to time, the manufacturer does tweak the design just a little. When we get a new shipment in, the text will be the same, but the color and layout may vary a bit. We do our best to keep a picture of our current stock on the site, but please understand if there are minor differences. 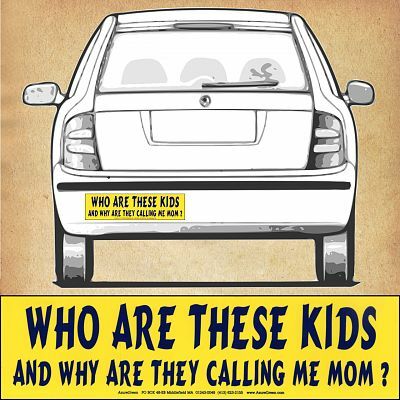 Do you have any other questions about our "Who Are These Kids…" Bumper Sticker?